Have you ever agreed to something and then realized that it involved more than you bargained for? Well this weekend I hosted a completely new to me food class at the farm! In fact I don’t consider myself an expert at all in the topic. Picture me Sunday morning, scrambling around in my kitchen’s sad state of wreckage, trying to pull together 7 different dips in 2 hours for the class later that afternoon. Yes, even re-washing the oily food processor multiple times! It looked like a bomb went off in there. But, I pulled it off! And the “Dip into Dips” class was awesome! But, why a dips class? The story behind it is kind of a funny one. And all starts with our Facebook community group for CSA members, a totally new thing for us this year. And a thing that I am really beginning to love. Why? Because it is a whole big group of people who love veggies enough to commit to 16 weeks of veggie mystery! And that is more than pretty cool. 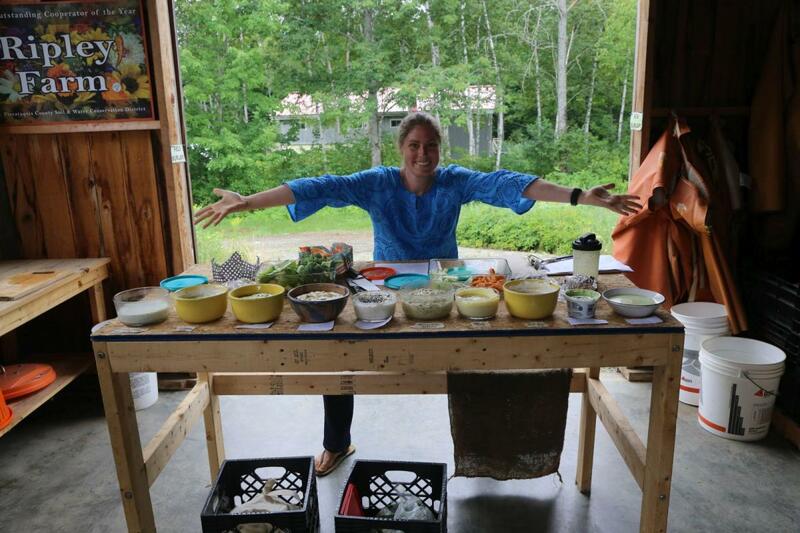 It’s incredibly inspirational to see all of the amazing things that are happening with seasonal veggies from our farm in kitchens around Central Maine! So I polled people on what class topic they’d be most interested in seeing and “Homemade Condiments” won. Then I polled everyone on what kind of condiment they want to learn more about, and “Dips” won. The funny thing about the “dips” class topic is that I don’t really make that many dips at my house. I kinda do the minimum. You know, get homemade food on the table that includes veggies for most meals. And dips really do get you eating more veggies! When you put dips out, your cut up veggies disappear. Fast. Really fast. The day after the class I went to visit family friends at their camp on the lake. Can you guess what I brought? DIP! And not just one, but a few. Hey I had made seven! Yep! That’s right you can eat more fresh raw veggies with the right dips. At this weekend’s class, all in all we had 10 dips and had a “taste test” with all of the class participants. Actually there was no consensus, probably because they were all so good. And everyone was quiet munching away on the cut up broccoli, salad turnips, pac choi stems, and baby carrots fresh harvested from the farm. Place zucchini cut side up on baking sheet and roast at 400 degrees for about 1 hour or until very soft. Let zucchini cool, then chop and place with all other ingredients into a food processor. Process until a smooth and creamy. Check salt and serve! Great substitute for mayonaise or can be used as a dip or spread. Store in the refrigerator. Mix curry powder, salt, and mustard into sour cream. Use mixture as a dip for vegetables. Add all of the ingredients to food processor except the salt and pepper. Pulse until all ingredients are well combined. Taste and add salt and pepper to taste. Transfer to a container with a lid and refrigerate for a minimum of one hour to let the flavors develop. Stir all ingredients together to combine well. Refrigerate for a minimum of one hour to let the flavors develop. Add all ingredients to the food processor and blend until smooth. Refrigerate overnight or until firm. Garnish with poppy seeds before serving. And for even more dip inspiration download the handout I created for the class here. What is your favorite dip for veggies? Post a comment and let us know!